It’s a good question. Most of the time, there’s very little actionable in international news. Understanding the impeachment of Dilma Rousseff might be useful if you’re an investor in emerging markets, but it’s unlikely that your attention can change the shape of events in Brazil. That might not be the case in Ethiopia. Ethiopia is Africa’s third most populous nation, and is near the top of the league table in repression as well, with at least ten journalists in prison for exercising their rights to report freely. The former prime minister, Meles Zenawi, ruled from 1995 to his death in 2012, and his successor, Hailemariam Desalegn, looks awfully secure in his job as the ruling EPRDF and its allies won all 546 parliamentary seats in the last election. While Ethiopia is populated by dozens of ethnic groups, most senior members of the ruling party are of Tigray origin, a group that represents about 6% of the population, but which led the guerrilla war that defeated the Derg, the communist military junta that ran Ethiopia from 1975 to 1991. 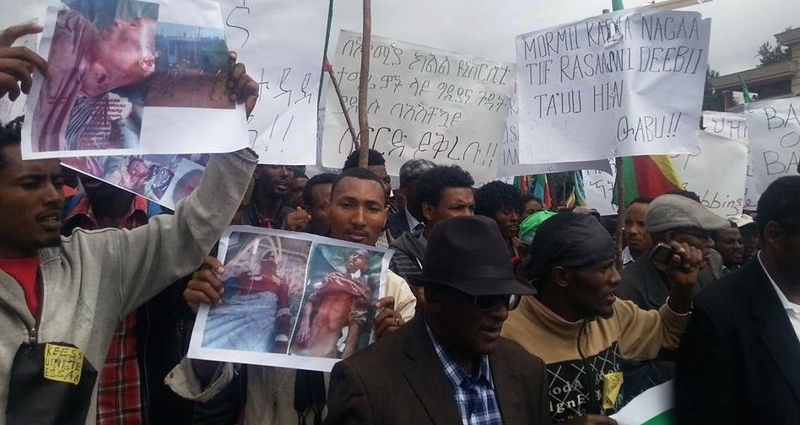 Many Oromo (34% of the population) and Amhara (27% of the population) feel marginalized by the Tigrayan government, a situation that has grown more tense as the government has announced plans to expand the capital Addis Ababa into traditional Oromo lands and farmers feared their lands would be seized. Protests have been ongoing since November, but they turned bloody this weekend as the Ethiopian security forces used live ammunition to disperse crowds, killing as many as 100. (This, unfortunately, is standard procedure in Ethiopian crowd control – sadly, I’ve been writing about it for more than a decade.) Human Rights Watch reports that up to 400 have been killed by the government and tens of thousands arrested in protests thus far. Of course, it’s hard to know what’s actually going on in Ethiopia. As protests have heated up, Ethiopia shut down the internet in provinces where people have taken to the streets, hoping to disrupt organizers. (This isn’t hard, as there’s one ISP and one telephone company in Ethiopia.) A shutdown earlier this year, which coincided with protests spreading into the north of the country, was evidently done for the benefit of university students, to keep them from cheating on exams. Given the government’s tendency to arrest reporters or bloggers and imprison them for years (Ethiopian bloggers affiliated with Global Voices were held for 18 months in prison), the exact details of what’s happening in Ethiopia can be very hard to pin down. Well, international opinion actually matters to Ethiopia. Ethiopia is a military ally of the United States, and we send nearly a billion dollars in aid, mostly development and food aid per year. Shamefully, Addis Ababa is the diplomatic capital of Africa, home to the African Union. As human rights abuses get out of hand in Ethiopia, the US has limited aid in the past, and the AU occasionally threatens to grow a spine. The UN is now asking to put observers in Ethiopia, which the government is resisting. The biggest help the world can give the Ethiopian government is ignoring what’s going on. It’s summer, it’s hot, the Olympics are on, and Trump says something insane every other day. There’s not a lot of space in the daily newspaper for a crackdown in Ethiopia. But international attention is one of the few ways to keep Ethiopia’s insanely repressive government in check. So please follow what’s going on in Ethiopia. We’re writing lots about it on Global Voices. OPride offers moment to moment updates on protests in Oromia. NPR, BBC and Al Jazeera are all actively covering the story, even if most US media has adopted the “all Trump, all the time” format. Reward their stories with your attention, talk about Ethiopia on social media and help other people pay attention to this story. There’s not much you can do to prevent Ethiopia from crushing a rebellion, but you can make it hard for them to do it silently, unwitnessed by the rest of the world. Global Voices author Endalk is mapping protest deaths in Oromia on this interactive map. Warning, some of the images are disturbing. This entry was posted in Africa, Global Voices, Human Rights, Media. Bookmark the permalink.